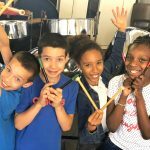 Reading All Steel Percussion Orchestra was formed in 1997 supported by Arts Council England’s New Audiences Programme with instruments and tutors provided by Mangrove Steel Band. Central Reading Youth Provision offered space for a PanYard and CultureMix Arts coordinated the project led by its Artistic Director Mary Genis. 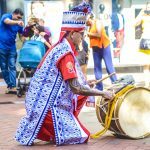 This followed a pilot carnival project co-ordinated by African Caribbean Arts Development at Reading Borough Council offering carnival costume making and steel pan music workshops supported by local communities. RASPO is now well established as Reading’s premier steel orchestra and welcomes all age groups. The name – Reading All Steel Percussion Orchestra – commemorates the very first steel band to play in the UK at the 1951 Festival of Britain: TASPO Trinidad All Steel Percussion Orchestra. ‘RASPO Live!’ 2009 The Abbey Gateway Reading Berkshire. ‘RASPO Rhythms’ 2012 The Tabernacle Notting Hill London. 2009 British Association of Steelbands Award for 10 years of performance. 2010 Randolph Baptiste Inspirational Award. 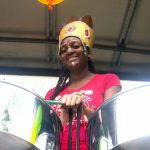 Click here to book RASPO Steel Band. Click here for RASPO workshops.